Jim Tucker has called Sycamore his home for most of his life. Music was always an important part of his life beginning with the Metropolitan Opera Broadcasts when he was a child. He studied voice during high school with Northern Illinois University Professor Howard Dill and has sung with many groups over the years. He became interested in stringed instruments when his younger children, Jamie and Maggie, were in the Sycamore Suzuki Violin Program. 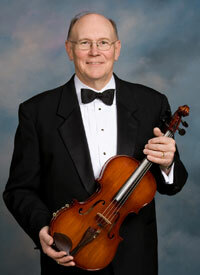 He studied violin and then viola and began playing with the KSO in the early 1990s. Jim is a graduate of Northern Illinois University with a B.A and M.A in Economics. He also holds a certificate in Management Accounting from the Institute of Management Accountants and has worked as a corporate accountant and general manager for many years. He is now retired but also buys and sells fine art and antiques. Jim and Ann Tucker live in Sycamore. They both enjoy restoring old houses in Sycamore, sailing and other outdoor activities. Jim enjoys most operas including those by Puccini and Wagner. Favorite orchestra pieces include the Three Sea Interludes of Benjamin Britten and the Adagio for Strings by Samuel Barber.